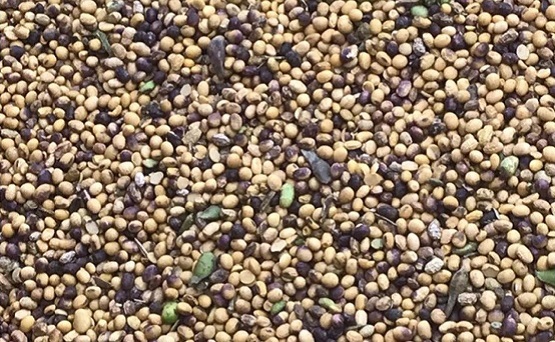 Purple Seed Stain was more common than normal in the 2018 soybean harvest. While yield is minimally impacted as the damage is mostly cosmetic, grain quality may be downgraded due to discoloration. More sightings of the disease raise questions about planting stained soybean seed and mitigating risk of disease infection. Soybeans with substantial discoloration should not be saved for seed. Color sorters are used to minimize the amount of purple stained seed going into seed soybeans. Seed germination may be delayed when the purpling is more than half of the seed coat. Standard germination tests are used to make sure minimum germ requirements are met. Seed Treatments: How Effective Are They? Using a fungicide seed treatment is highly recommended for purple stained seed. Treating purple stained seed may help decrease early infection and therefore help reduce seeding loss. However, the level of disease expression later in the season is mostly dependent on environmental conditions that favor infection rather than its presence in the planted seed. Rainfall, high humidity and temperatures over 80 degrees during flowering are ideal for infection. No-till or high residue fields may host more inoculum as the pathogen survives on crop residue. The fungal pathogen responsible for Purple Seed Stain can also cause Cercospora leaf blight. To reduce risk for both diseases, apply a fungicide between R3-R5. A fungicide application during this time may help limit yield loss, improve seed quality, and reduce blight incidence and purple seed stained pods. Crop residue incorporation and rotation away from soybeans will decrease the pathogen’s inoculum. Switching varieties may also reduce disease incidence as it’s believed that genetics play a role in disease resistance to infection. Contact your Golden Harvest Seed Advisor with questions or for additional agronomic insights.